Excellent tires but they don't last more than 30,000 miles. The tread wears out very quickly in my opinion. 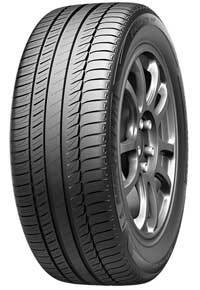 It has excellent traction and cornering stability and those are good reasons to stay with the same tires every 3 years. My car is 9 years old and I am ready to purchase my third set of Primacy HP rear tires. I bought a set of these Michelin tires for my Nissan Maxima and I have been extremely impressed with the responsiveness. I have replaced my OEM Goodyear tires with a new set of rubbers from Michelin and it has been a complete change in my driving experience. The Michelin tires are hard to break away from the pavement, they have been a terrific in snow, and I have full control while pressing the tires to the limit. I think if you want a tire to be compliant, stable, predictable, and long lasting, the Michelin Primacy HP is the right tire for your vehicle. I am a mildly spirited driver and I believe these tires offer the best driving experience that satisfies my need to move. I like these tires and I never have a problem with them. Great tires, low road noise, great gas mileage. I got 32 mpg last weekend. Car rides like a large, comfortable sedan with these tires. Good tires, just not in very snowy conditions. These Michelin Primacy are the best tires I have ever purchased. At 38,000 worry-free miles(in 4 years I have never once even had to add air!) they are almost double the tire life I am used to. I will absolutely be replacing them with another set of the same. I bought Michelin's based on reputation and advice of my service pro.